BEAVERTON, OREGON, September 18, 2018: Audio Precision announced today the availability of APx audio measurement software version 4.6. 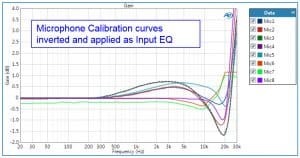 With this release, AP has added the ability to perform measurements using the logarithmically-swept sine (i.e., “chirp”) in an open-loop configuration, multichannel input equalization, DTS:X support and the automated import of measurement equalization curves. With an enhancement that will be of interest to those developing smart devices (e.g., smart speakers, smartphones), APx release 4.6 enables open-loop measurements using the chirp test signal. This signal provides multiple, high-resolution results in a brief period of time and now APx users can employ the chirp in test scenarios where the signal may originate, or terminate, as a file on the device under test (DUT) or on a server connected to the DUT. APx release 4.6 also adds the ability to simultaneously correct for multiple microphones. From left and right ear simulators in headphone testing to a sixteen-microphone array being used for car tuning, APx audio measurement software now provides real-time filter-based correction of all input signals. Version 4.6 also adds support for DTS:X™, enabling the playback and capture of pre-encoded DTS:X bitstreams by developers working to meet DTS compliance test requirements. For Bluetooth® Duo equipped APx analyzers, AAC MPEG-2 codec support is now enabled. Finally, input EQ curves can now be imported as part of an APx automated test sequence. Release version 4.6 will not operate (except in demo mode) without an APx KeyBox installed on the user’s APx audio analyzer. For additional information on the APx KeyBox, including how to request one free-of-charge, users should visit https://www.ap.com/home/apx-keybox/. The release is available for download by registered users of AP.com and is compatible with all analyzers in the APx500 Series. Use of the open-loop chirp capability with APx515 analyzers requires at least one software option or bundle that contain a supported chirp measurement. DTS, Xperi and their respective logos are trademarks or registered trademarks of affiliated companies of Xperi Corporation in the United States and other countries. This entry was posted in News, Press Releases and tagged APx KeyBox, DTS:X, multichannel input EQ, open loop chirp, Open-loop continuous sweep, v4.6 by Eric. Bookmark the permalink.